tacos (previously known as $N@K3) is a top-level Super Smash Bros. 64 player from Brownsville, Texas currently residing in Kingsville, Texas who is considered one of the best Smash 64 players in the world. He is also regarded as one of the two best Yoshi players in North America along with Wizzrobe. He is also highly proficient with many characters, such as Pikachu, Jigglypuff, Captain Falcon, and Kirby. tacos is currently ranked 14th on the 2017 64 League Rankings. He is one half of Team Luv along with the Canadian player The Z, a very strong doubles team who notably took second place at Apex 2015.
tacos uses a Hori controller. He is known for his very unconventional style, unpredictable combos and high technical skill. He is extremely proficient at using the parry, and has great movement fluidity. His playstyle is also sometimes seen as disrespectful, due to his tendency to sandbag when ahead in a match, and frequently utilizing taunt canceling. tacos made his competitive debut at Apex 2014, where he finished an unexpected 5th place after taking convincing victories over top players such as The Z 2-0, Revan 2-0, Dext3r 2-0 and Ruoka Dancho 3-1, using a combination of Yoshi, Captain Falcon and Kirby. He lost to Isai 2-0 in finals of his pool, and to SuPeRbOoMfAn in the losers' bracket. tacos returned a year later to Apex 2015, this time taking second place after notably defeating banze 2-0, Mariguas 3-2 and Wizzrobe 3-1. He was double-eliminated by SuPeRbOoMfAn, 3-1 in winners' finals and 3-0 in grand finals. He also placed second in doubles teaming with The Z (Team Luv), losing to the teams of Star King & Killer in the winners' bracket and SuPeRbOoMfAn & JaimeHR (Team Mejor) in grand finals. 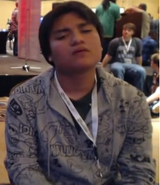 In early August of 2015, tacos traveled Super Smash Con 2015 in Virginia, where he defeated several top players before losing to SuPeRbOoMfAn 3-0 in winners' finals, and was then upset 3-0 by KeroKeroppi in losers' finals. He won the doubles bracket, teaming with SuPeRbOoMfAn. Later that month, Operation Desert Smash took place in Arizona, where tacos placed 3rd in singles after defeating Bark Sanchez and Revan and losing to SuPeRbOoMfAn 3-0 and JaimeHR 3-1. At Genesis 3 in January 2016, tacos made top 8 after losing a close set to SuPeRbOoMfAn 2-1 by defeating The Z 2-0. He finished 7th by losing to Isai's Fox 3-0. He placed second in doubles teaming with The Z, defeating strong teams such was wario & wangera 3-2 and Isai & Rith 3-1, only losing to Team Mejor. At Pound 2016 in April 2016, tacos brought his set record against KeroKeroppi positive by double eliminating him 3-1 and 3-2 in Winner's semi-finals and losers' finals, respectively. He also defeated Revan 3-1, and was again double eliminated by SuPeRbOoMfAn 6-0. At Snosa 2016, tacos went on to defeat Dext3r 3-0, Mariguas 3-2, KeroKeroppi 3-2, and Isai 3-2 to place 2nd, losing to SuPeRbOoMfAn. He placed 4th in doubles, teaming with Jimmy Joe. At Super Smash Con 2016, currently the largest Smash 64 tournament in the game's competitive history, tacos was upset The Z 2-0 in the winners' bracket, and was again upset by Kort 2-1 in the losers' bracket, after the latter switched off from Link to Pikachu and Captain Falcon after losing the first game. In doubles, Team Luv ended up placing 3rd after losing to Isai & Alvin 3-1 in winners, then a close set in losers' finals against Team Mejor which ended 3-2. At ODS II, tacos dropped out of the tournament in the winners' bracket by forfeiting against Stranded during game 3 of their set, when he had 3 stocks left and had taken 82% damage on that stock. He claims he will not travel to another tournament until Kansai 2017 in Japan in March 2017.
tacos has been a prominent net play player since 2011. He only holds negative records to SuPeRbOoMfAn (0-11), Isai (1-2), Kort (0-1) and Stranded (0-1). This page was last edited on January 7, 2019, at 18:21.